Fans of Indianapolis, IN-based artist, Kink, know that he is not one to shy away from intense, often frightening, sounds in his music. His latest track, “BLOODONMYGUCCI,” however, manages to stand out as his most unrelentingly fearsome outing to date. The grimy and industrial beat, expertly produced by Kink and his brother, zacariiah, accents the aggressive lyrical stylings of Kink, Baylor.23, and Mac. All three of these artists make the most of their featured time on the track, promoting their own distinctively unique flows and brands of antagonism. 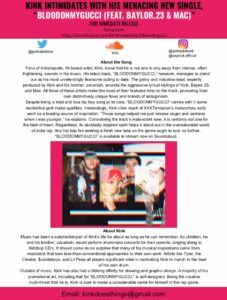 Despite being a tried and true hip hop song at its core, “BLOODONMYGUCCI” carries with it some borderline goth metal qualities. Interestingly, Kink cites much of XXXTentacion’s melancholy early work as a leading source of inspiration. “Those songs helped me just release anger and sadness when I was younger,” he explains. Considering the track’s malevolent tone, it is certainly not one for the faint of heart. Regardless, its decidedly inspired spirit helps it stand out in the oversaturated world of indie rap. Any hip hop fan seeking a fresh new take on the genre ought to look no further. “BLOODONMYGUCCI” is available to stream now on Soundcloud. Music has been a substantial part of Kink’s life for about as long as he can remember. As children, he and his brother, zacariiah, would perform impromptu concerts for their parents; singing along to Kidzbop CD’s. It should come as no surprise that many of his musical inspirations came from musicians that took less-than-conventional approaches to their own work. Artists like Tyler, the Creator, $uicideboys, and Lil Peep all played significant roles in motivating Kink to march to the beat of his own drum. Outside of music, Kink has also had a lifelong affinity for drawing and graphic design. A majority of his promotional art, including that for “BLOODONMYGUCCI,” is self-designed. Being the creative multi-threat that he is, Kink is sure to make a considerable name for himself in the rap game. Hip-hop artist illmef to release contentious album “Light a Fire,” new album taking aim at Donald Trump.